Britton’s art defines the connection and intimacy between artist and subject. Britton’s work explores the depth of the person they represent, capturing in paint an expression of a sitter no photograph can replicate. At the young age of twenty eight, Britton has become a premier portrait artist in an extremely short amount of time. Britton's art is currently in collections around the world, including the U.S., Canada, and U.K.
K.L. Britton is an American artist, currently working in Los Angeles, CA, and has been called one of Los Angeles’ hottest new portrait artists. Britton’s work is influenced by great masters of the past and present. Britton studied with Jeremy Lipking, as well as studying at Academy of Art University’s Fine Art Painting and Drawing department. 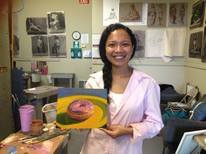 Britton has taught many students, beginning and intermediate, in drawing and painting. Jerry's Self Portrait Competition 2013 - Honorable Mention - "Phoenix I"
Dian Paramita is a fine artist based in Dallas, TX. She graduated from the reknowned painting program at Studio Incamminati, founded by a world-renowned painter Nelson Shanks. Her artistic background includes skills in painting and drawing in the style of contemporary realism. Dian's artwork encompasses still lifes, figures, and portraits. Through her artwork, Dian aspires to share her appreciation of everyday matters that are often taken for granted. Dian is a native Indonesian. She maintains studios in Dallas and Jakarta. A. Yoshida is an American Photographer that has spent most of their life traveling the west coast of America. Through Arizona, California, New Mexico, Nevada, and Texas, Yoshida has managed to capture the true beauty of America's natural wonders over the course of 15 years. Specializing is historic landmark and wildlife photography, as well as product photography for catalogs, Yoshida's natural photographs are a unique look into the rare and endangered natural resources of the American west. Uniquely expressed through the viewfinder, you will find a world you never realized existed here in the American west. Yoshida currently resides in Los Angeles area, in Southern California and frequently visits their hometown of Carefree, Arizona, another American locale gifted with unique natural beauty, and a history of deep country culture. Chris Brizzard started his formal training in drawing when he moved back to Texas in 2013 and began studying with Michael Mentler at the Society of Figurative Arts (www.tsofa.com). From 2014 to 2017, he studied drawing and painting at Studio Incamminati under instructors trained by Nelson Shanks. He has now moved back to Texas again to teach at TSOFA and The Craft Guild, both located in Dallas. Influences include Dan Thompson, Darren Kingsley, Stephen Early and Alex Kanevsky.